MELFORT, Sask. 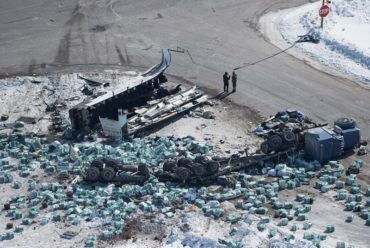 _ A truck driver who caused the deadly Humboldt Broncos crash has been sentenced to eight years in prison. She also noted that Sidhu’s remorse and guilty plea were mitigating factors, but added she had to consider the number of people who died or were severely injured and face lifelong challenges. Sidhu barrelled through a stop sign and into the path of the junior hockey team’s bus at a rural Saskatchewan intersection last April. Cardinal started the sentencing by acknowledging it would be emotional and asked people not to talk in court. Cardinal said she believed Sidhu was sincere in his remorse. She also spoke of Sidhu’s actions in the moments before the crash. A sentencing hearing in January heard that Sidhu was going between 86 and 96 km/h when he passed four signs warning him about the upcoming intersection before he came up to an oversized stop sign with a flashing light. Crown prosecutor Thomas Healey said Sidhu should have seen the busy highway in front of him or a car that was stopped across the road and waiting for the Broncos bus to pass. He described the truck as a rocket that barrelled into the intersection, which gave the bus driver no time to avoid the crash. Defence lawyer Mark Brayford said Sidhu was hired by a small Calgary trucking company three weeks earlier. He spent two weeks with another trucker before heading out on his own for his first time. This sentence is BS. First time out in truck. Seriously?